Dimensions: H 420 mm x W 380mm (excludes handles). Handle Length: 510mm. 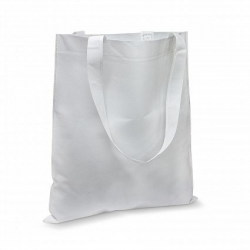 Description - Reusable tote bag which is manufactured from robust 120gsm matt laminated non-woven material. 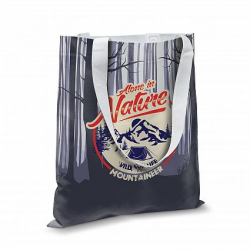 It can be branded in stunning full colour on both sides and the handles are available in 12 colours. A lead time of approximately 25 working days applies to this product by air freight and larger orders can be sea freighted on request to reduce the freight cost. Gloss laminate is available on request. Colours - Handles: White, Yellow, Orange, Pink, Red, Lime, Dark Green, Teal, Royal Blue, Navy, Purple, Black. Lead Time: 25 working days after artwork approval.